I am the one that always sweeps the back yard, and we have a small space so it is not all that much, but it takes 30 minutes. Broom, dust pan, trash can and lots of bending over. It is tiring and so this year I finally upgraded to a leaf blower. 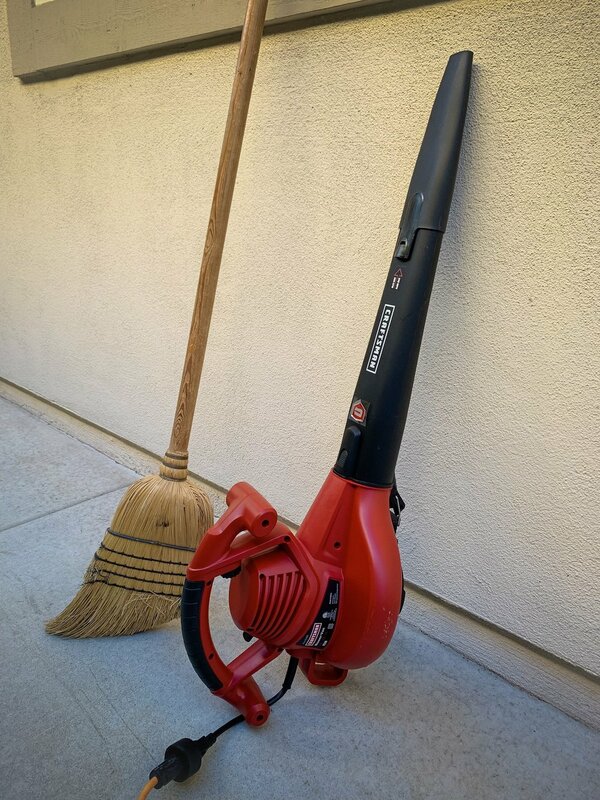 Some time ago, jokingly I told my husband I wanted a leaf blower, but he quickly dismissed that as a real thing. I kind of did too, until I saw her. Yes her! We met at Sears just a couple weeks ago. It was a quick pop into Sears since they are going out of business and hubby wanted to look at their tools, for duplicates of all that he already owns. So I am cruising the holiday and garden isle and saw this Craftsman small powered blower totally on sale for $65, wanted to buy it but got a stern NO. I know not to push, so I left it…but then went back a couple days later. Well everything must go, so they sold out. No worry I hit the phone and before I even left the store, my Sears order was in for two blowers on sale for $55 each. Second was for a friend’s husband who I told the story of how I found it and he, like me, has wanted one for a while. Well today is our couples progressive dinner and we are hosting the main course so I know while our husbands are grilling the steaks they will partake in some cigars. I prepped the house, set the table, prepared what I could ahead of time, except forgot about the yard. OMG I remembered the blower and busted it out. SUPER HAPPY!!! MY FAVORITE PRESENT THIS YEAR, AND IT GOT IT FOR MYSELF. Already dressed, I grabbed it, blew away the dust and leaves in minutes without breaking a sweat. Old way would be sweeping which there is no way I could do in this dress. Upgrade worth it and only $60 with tax. This gift will get so much use and I would highly recommend getting one for you or a loved one that dreads yard cleanup like me. Blown away. Pun intended. I am no longer sweating by having to sweep, and can Be Awesome and Sparkle.